There is a great song by Neil Young called "Old Man" and I think of that song when I look at pictures of this humble farmer we encountered a few times at different markets in the area. On a rainy day he was the only one without an umbrella so he caught our eye. Oh what a sweet man he was. 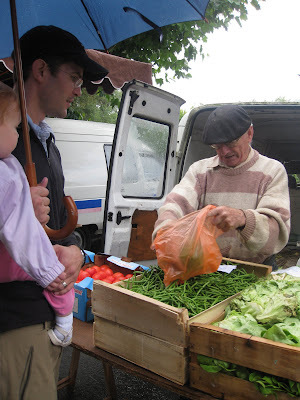 We bought some of his delicious haricots verts one day and then some more another day...at another market. 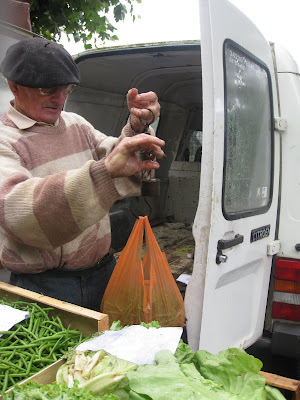 It was worth the 8 Euros just to see him whip out this ancient instrument to weigh our goods...excellent beans aside. I find it incredibly refreshing that there are people out there like him. I will remember our short encounters with him for a long time. I love buying directly from farmer's. It makes me so happy to support them! 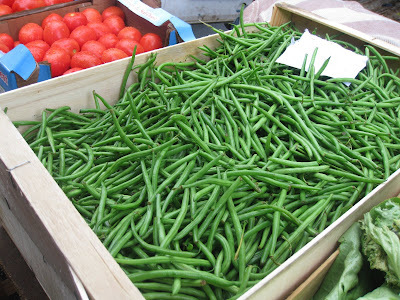 Wow, and I thought I bought a lot of green beans at the farmer's market. Also, I can't figure out how B. is holding S. and holding that umbrella. It's impressive! They are very beautiful vegetables!